We just wrapped up a very successful National Engineers Week with lots of activity from ESWP and our affiliates! ESWP’s annual engineering awards banquet was held on February 15 with 400 guests in attendance, with a great response from our attendees. During engineers week ESWP played host to the annual banquets celebrating engineering from ASCE and PSPE, as well as played a part in a number of other engineers week activities promoting the profession including the annual Future City competition. Congratulations to all of the award recipients! The Engineers’ Society of Western Pennsylvania (ESWP) is pleased to announce the winners of our 2017 Awards of Distinction! The awards, along with the William Metcalf Award presented to J. Fred Graham, will be presented at ESWP’s 135th Annual Engineering Awards Banquet on Thursday, February 15, 2018 at the Westin [Convention Center] Hotel. Guest speaker is Jimmy Krenn, with Master of Ceremonies Rick Sebak. More information and reservations can be found here. 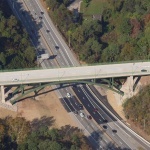 The Greenfield Bridge Project offered a unique opportunity to implement state-of-the art design practices while creating a landmark structure at the entrance to one of Pittsburgh’s most historic parks. This setting encouraged an innovative, context sensitive design that embraced the bridge’s role as not just a transportation facility, but as a part of the community. The reuse of architectural elements from the previous bridge in the new design reestablished the bridge as a grand entrance to the park. Additionally, innovative design concepts allowed the steel arch and floor system to be erected in just one weekend closure of the underlying Interstate. 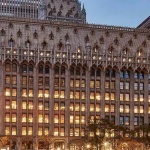 The 11‐story Union Trust Building was built in 1915 and 1916 by coal and steel magnate Henry Clay Frick on a full block of downtown Pittsburgh. The Flemish‐Gothic Union Trust originally opened to much fanfare as a multi‐level shopping arcade with 240 shops on the lower levels and 700 offices above. The Commercial 667,000 square foot Office Building costs $36 million to renovate. as an off-site parking facility. 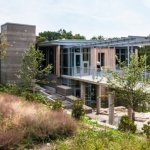 The Frick Environmental Center is a new environmental education facility located in Frick Park in Pittsburgh, Pennsylvania. The project is the first Living Building Challenge-targeted facility that is both municipally owned and free and fully open to the public. 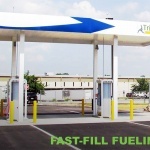 In 2016, Larson Design Group (LDG) teamed with Trillium CNG to design, build, finance, operate and maintain a program of CNG fueling stations in Pennsylvania. 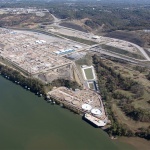 The stations will supply locally sourced compressed natural gas (CNG) to more than 1,600 public-transit buses at 29 agencies across the Commonwealth to save fuel and operational costs at a net zero development cost to taxpayers. Thanks to the more than 420 guests who attended ESWP’s 133rd Annual Banquet on February 15, the event was a big success. Held at the Westin Hotel, the evening was filled with good food and fellowship, uplifting messages and entertaining presentations. Congratulations to all of the award recipients in our Project of the Year program as well as ESWP’s Engineer of the Year, Jim Foringer of PennDOT District 11-0, and a special recognition for Dr. Deb Lange upon receiving ESWP’s Metcalf Award, the first female to do so in the history of the 53-year old award. Congratulations to all of the 2016 ESWP Award recipients, starting with our Engineer of the Year: Jim Foringer, Assistant District Executive-Construction for PennDOT 11-0. Our Projects of the Year recipients are as follows: in the Commercial category, we are pleased to recognize UPMC Lemieux Sports Complex; in the Industrial category, we are pleased to recognize the Center Township Potable Water Source of Supply Transmission and Interim Water Treatment Facility; in the Innovative Construction Methods, we are pleased to recognize Milton-Madison Bridge Project; in the Sustainable category, we are pleased to recognize Lower Hill Infrastructure; and finally, in the Transportation category, we are pleased to recognize Hulton Bridge. All of these awards will be presented at the February 15 Annual Awards Banquet. The Annual Awards Banquet took place on February 18th and was attended by over 400 members and their guests. The dinner was enjoyed by all and the program that followed included University of Pittsburgh and CMU Awards, the presentation of the Engineer, Projects of the Year and Metcalf Awards. Folks then listened intently to Buddy Hobart, founder of Solutions21. You can view the banquet video here. 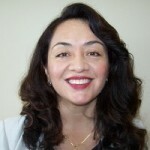 The ESWP Awards Committee has selected N. Catherine Bazán-Arias, Ph.D., P.E. to receive it’s annual “Engineer of the Year” award at the Annual Banquet on February 18th. The Project of the Year winners were also chosen. Please click here to view all the winners. The ESWP Annual Awards Committee is pleased to announce the following recipients of our 2015 Project of the Year Awards. These awards will be presented at the ESWP Annual Engineering Awards Banquet on Thursday, February 18 at the Westin Convention Center Hotel. The ESWP Awards committee has chosen James H. Garrett, Jr., Ph.D., P.E., F.ASCE, as the 2016 Metcalf Award Winner. 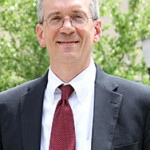 Dr. Garrett is currently Dean of the College of Engineering at Carnegie Mellon University. He will be presented with the Metcalf Award at the Annual Banquet on February 18, 2016.